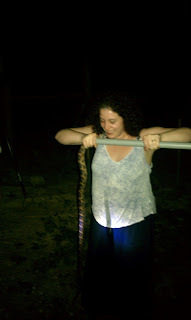 it was my idea to go back and get the snake pole, which was a dumb idea. i kinda wanted to go back and see...what? that the snake really got away? if we could recoup our highly effective snake capturing device? i don't know, but going back was a dumb idea. 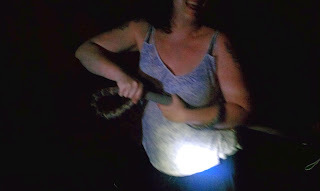 anyway, as we came back from running some normal summer monday errands, we happened to stop at the intersection where we had pulled off to release the snake the night before. there it was: the pvc pipe, with the snake next to it, tangled in the rope. i had thought that his head was free inside the pipe and he was backing out, and therefore would be okay, but it looked like he tried to slide out forward and got trapped. total relocation fail. the snake died. i feel really bad about this. i love snakes. we have two pet snakes for goodness' s(n)ake, a ball python and a corn snake. 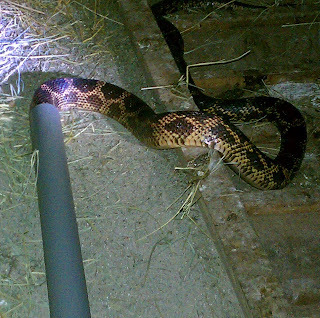 i was so thrilled that we had managed to deal with the egg-stealing snake problem humanely, but turns out, not so much. not for lack of trying! mostly for lack of experience. i guess it's good that we saw what really happened, instead of assuming super success. i am glad we tried to do the right thing, and i definitely feel like i learned something. i can't quite say what the something is, exactly, but it has to do with nature/domestication, ancient struggles, good intentions, fear, and decisiveness. anyway, sorry about that, texas rat snake. we really tried to do good by you. and i trust and hope you had a pretty easy snake life up until that last bit. if there's reincarnation, i hope you come back as something awesome. tonight, the war was won. we had dinner guests this evening, and had reached that genial point when dinner is over but wine is still present and conversations flit from one subject to the next. remembering that the chicken ramp was still down, i headed outside to put the ladies and gentleman to bed. in the half-light of the porchlamp across the yard, i counted the birds by giving each a gentle touch. i reached into ninja's normal corner of the nest box to count her, when i noticed she was sitting on the floor of the coop--not in her normal spot. at the same time i noticed that my fingers met something distinctly unfeathery. could it be? i looked around at the ladies and gentleman. no one seemed particularly alarmed. bolo even sat in her regular place, which would be next to ninja, except that ninja had politely surrendered her spot to the cool coiling shadow. was i just half expecting the snake to be there, and so had imagined that i touched it? with my bare hand? in the dark? i secured the ramp, closed the coop, and hurried inside, vowing to test my theory tomorrow in the daylight. but when i related my experience to my companions inside, dan got up and retrieved the industrial-size flashlight from the garage. we all marched outside, flashlight and pvc snake lasso close at hand. the chickens blinked at us in sleepy confusion as w. held the light, dan wielded the rake, and i held the lasso at the ready. the snake was a bit sluggish in the cool of the evening, and sated by his daily egg feast. after hay-removal and a bit of prodding, he uncoiled and started to make a break toward the back of the coop. dan pinned his middle with the rake. i slipped the loop of nylon rope over his head and pushed the pipe forward, trapping him. he coiled and uncoiled his 5 foot long body, very nearly dislodging himself from our double grip. finally, he stopped thrashing for a moment to assess his situation, giving us a moment to assess ours. w. took a turn at the rake, dan held the light, and we maneuvered into a siege position. we had left the pillowcase inside. "d," i asked, trying to sound brave, hoping the snake's head didn't slip into the pipe and come flying toward my face, "could you please go find a pillowcase? you can check in the linen closet, the second door in the..."
"just pull one off one of the bed pillows," dan said, ever practical. d. came back with a pillowcase in short order. at this point, the snake figured the only way out was through, and so he slipped his head up into the pipe (toward my face). dan quickly tied the open end of the pillowcase around the of the pipe, hoping that the creature would slither straight into it. this would have been successful, except the snake reached a point at which his middle was barely too big for the pipe. thus, he got stuck--two feet of him in the pipe, the other three hanging out the end. winnie the poo style, sort of, except longer and scalier and less cute. i reached down and grabbed his body where it entered the pipe, keeping him stuck. he writhed healthily, wrapping his tail around my arm and releasing a putrid defensive musk. at this point, we were confident that he could not escape. it was time to relocate the egg thief across the highway. d. and w. agreed to hold down the fort as dan and i hopped in the car for the final chapter of the snake battle. i held him steady inside the pipe, his tail wrapped firmly around my arm, until we got across 183 and down a convenient side street with an empty lot. dan untied the pillowcase, and i started to loosen my grip; the snake sensed freedom was imminent, and started thrashing anew. on a count of three we threw the snake, pipe and all, in one direction and retreated in the other. i think i saw him slither off, freed of his pvc prison. and so, the texas rat snake war has ended--i hope. could there be others? was that one just one of many? i respect you, texas rat snake, you are strong and nimble and quick and scary. but should you or any of your kind come back, we are now seasoned snake battlers. we shall defend our eggs and our (rather complacent, to the point of snake room-mate welcoming) flock. you will be relocated! 2) i'm glad we didn't have to kill it. there was a moment there where it seemed like that might be the only option. i am thankful that we were able to drive it across the highway and let it go be a snake someplace else. catch some rats or something, rat snake! 3) so much for the big mean rooster defending his hareem. what a..........chicken. oh. 4) snake musk = stinky and sticky, and unlike any other smell i've ever smelled. noted! that's a pretty good defense mechanism. 5) the snake fought bravely, and we fought bravely. we have had TUF success. now....Five! Egg! Day?